A mechanic's & operator's dream. 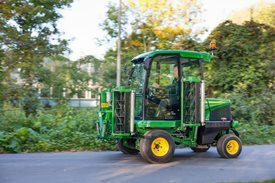 The John Deere 1905, five gang wide area reel mower, has a total cutting width of 345cm (136in) at working speeds of up to 8mph. 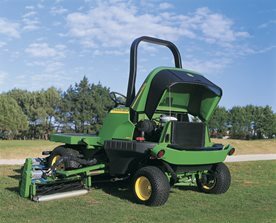 Designed primarily for golf & amenity turf applications, this four wheel drive mower features a Yanmar 51hp (gross) four cylinder diesel engine, hydrostatic transmission, CommandARM armrest controls and optional 4WD. 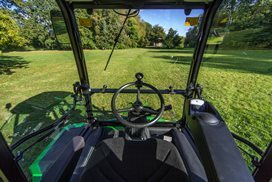 Initial production models are being fitted as standard with 76cm (30in) extra strength and precision (ESP) cutting reels, which are particularly popular with golf course users looking for higher productivity. 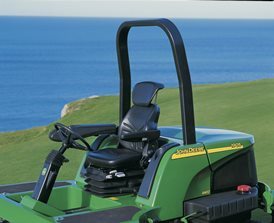 The luxury cab comes with a standard air suspension seat, providing unmatched levels of operator comfort on a machine in this class. Option of full air conditioning to provide a comfortable working environment in the challenging conditions. 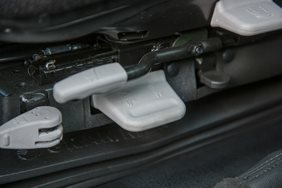 Standard power steering and fingertip controls on the CommandARM add to the ergonomic design of the 1905. Individual unit lift can be controlled via 3 independent lift and lower switches on the CommandARM. There is also the added convenience of a single switch cross cut function which allows lifting of all the cutting units together in the horizontal position for turning. Standard instrumentation includes an hourmeter, a temperature guage for hydraulic oil and engine coolant. Noise levels reach 83dB(A) measure at the operator's ear, with an environmental rating of 99dB(A). This is well within the European directive of 105dB(A). The 1905 comes standard with four-wheel drive (4WD), differential lock, weight transfer system, and two speed ranges. 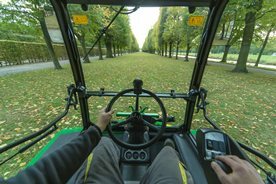 The productivity of the 1505/1515 Comfort Mowers starts with a powerful engine that performs in any application. 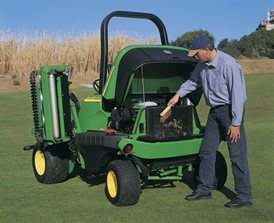 Serviceability makes daily maintenance easy, keeping the machine at peak performance. 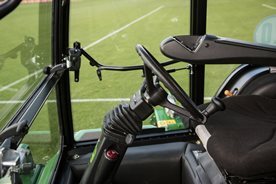 The rotate-for-service front cutting units support cleaning and service of the front cutting units while providing access to the center unit. Dual air filter element, dry type, replaceable for clean engine air and long engine life. 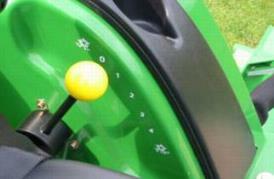 An air restriction indicator lets the operator know when it is time for service. 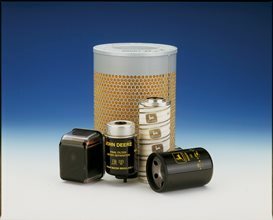 Relays and fuses are lined up and centralized for good overview and easy reach. 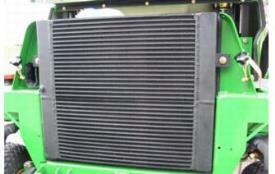 The lower part of the hood exposes the hydraulic cooler for easy service. The white box diagnostics are located on the operator station. 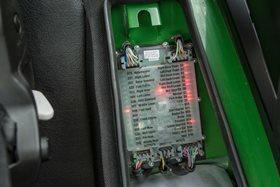 They control the electrical system. A simple but effective system shows the operator when an electrical problem occurs and in what circuit. 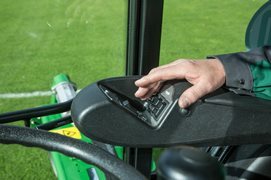 The location next to the operator seat makes the white box easy to use while sitting on the machine. The open station version standard comes with ROPS. A factory-installed cab is an available option. Operator comfort is the main feature of the 1905 design. *Cross cut is a function that lifts all cutting units together in the horizontal position – just high enough for turning. 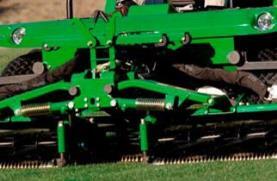 The cross-cut function improves ease of operation and productivity. 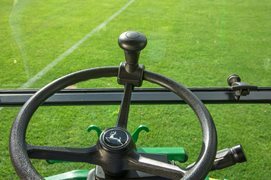 The reel speed lever allows adjustment of the reel speed according to the mowing condition to provide the best cutting performance. It also enables a backlapping function for resharpening the reels on the machine. The backlap function may help to remove obstacles from the cutting unit. The 1905 comes with optional work or road lights. The rear lights are integrated in the frame and well-protected against any damage. Internal wet disk brakes are maintenance and service free. 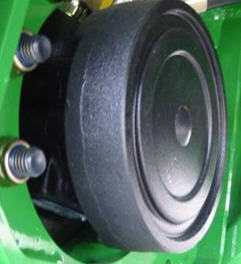 Differential lock is standard on the 1505 and the 1515. 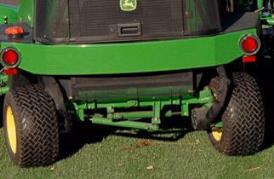 The differential lock locks the two front drive wheels together to provide extra traction. 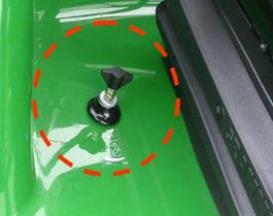 A comfortable electrical pedal switch is located on the left operator station. 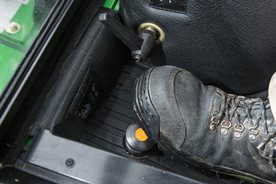 It is operated with the left foot while the right foot maintains speed and the hands stay on the steering wheel. 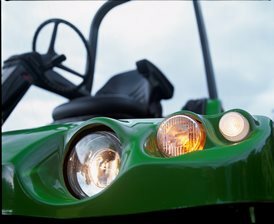 Four pumps directly in line with the engine output shaft-mounted pumps provide power to the drive and the mowing circuit. 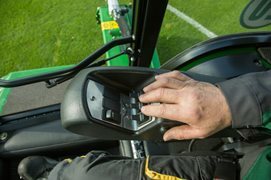 Hydraulic weight-transfer system transfers weight from the deck to the traction unit to improve traction in tough conditions.